Vegetable companion planting is a method of pairing vegetables that grow well together in a way that is beneficial. If you’ve never heard of it, or you’re interested in learning more about what vegetables to plant next to each other, then this beginner’s guide is for you! Before we dig in, I want to say that this is a very vast topic, and I can not totally cover in one blog post (there are entire books on the subject!). 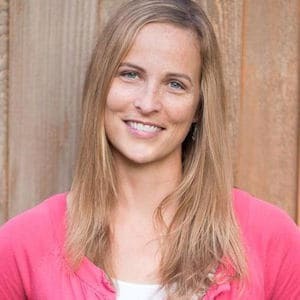 Since it’s such a huge topic, it can be very overwhelming for new gardeners. So in order to avoid the overwhelm, I’m just going to start by giving you an introduction to companion growing in this post. 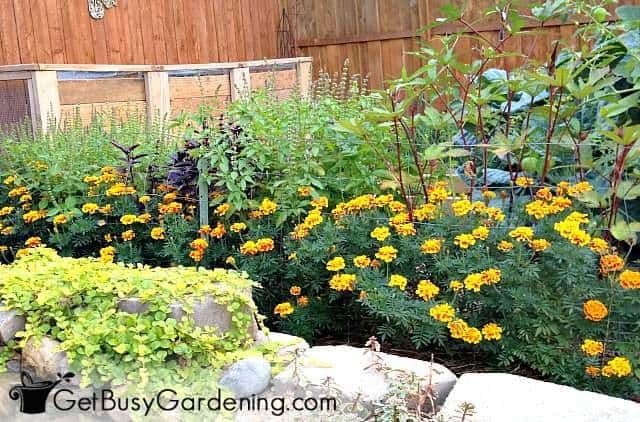 Then, to get you started quickly, I’m including a list of companion planting ideas you can try in your garden right away. Also referred to as “companion gardening” or “companion cropping”, companion planting is a way of grouping compatible vegetable plants together so that they will enhance or benefit each other in different ways. But it’s not just about which vegetables grow well together, it’s also about what NOT to plant together. Some vegetables don’t like each other, which can cause negative effects when they are planted together. So companion planting is about combining compatible vegetables, as well as avoiding the bad plant combinations. Any plant that is beneficial to another type of plant in some way is referred to as a companion plant. For example, plants can benefit their companion vegetables by enriching the soil, providing shade, or attracting predatory insects that will feed on the bugs that commonly attack them. On the flip side… some plants will compete with each other for nutrients, water or sunlight, or attract pests that plague other plants. These are not companion plants, and therefore should not be planted together. Why Is Companion Planting Important? It’s important to understand what plants grow well together in order to have a healthy and productive vegetable garden. 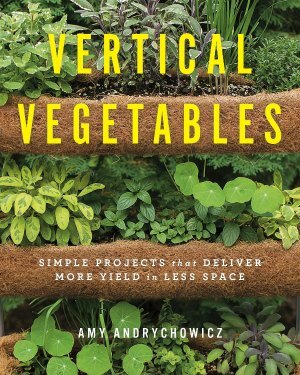 Knowing what vegetables NOT to plant together is also a really good thing to learn about. 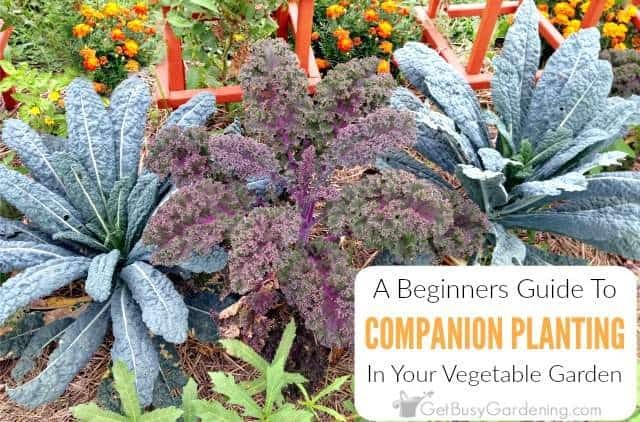 Once you get the hang of it, you can use companion vegetable gardening to help with pest, disease and weed control. That way you can prevent many common vegetable gardening problems, and give your plants the best growing environment that you can. Companion gardening has many benefits, including controlling pests, disease and weeds in the vegetable garden. Some vegetables can help enhance the growth, productivity and flavor of others, or deter the pests that feed on their companions. Certain plants also work as trap crops to lure pests away from vegetables, or improve the quality of the soil. Taller plants can provide shade to cool season vegetables that don’t like the sun, and can double as plant supports for vining crops. Companion planting is also a great way to utilize the garden space that you have, especially for small gardens. Like I said, it can be overwhelming, so try to focus on the which vegetables can be planted together first. Once you get the hang of that, you can worry about avoiding the bad combinations. 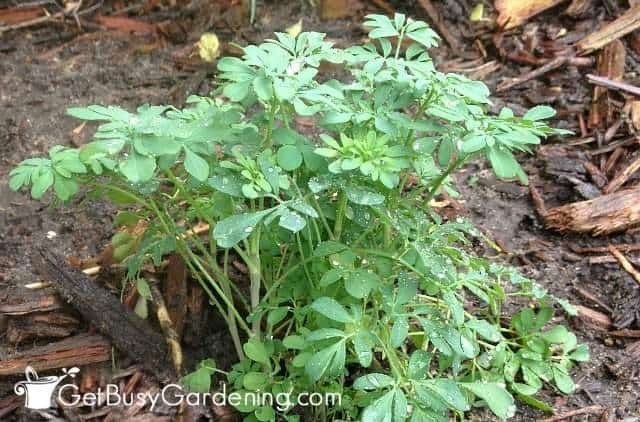 To get you started quickly, I put together a list of easy beneficial plant pairings you can use in your garden right away. 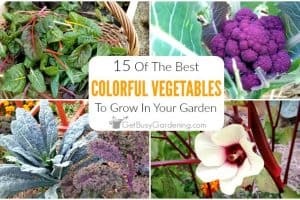 This companion planting list includes many of the common vegetables you probably are already growing, and shows you what plants grow best together. Dill with cabbage family and cucumbers – Dill helps to deter pest insects like the flea beetles. Attracts pollinators and predatory insects that feed on pests like the cabbage worm. It’s also a favorite host plant for the black swallowtail butterfly! 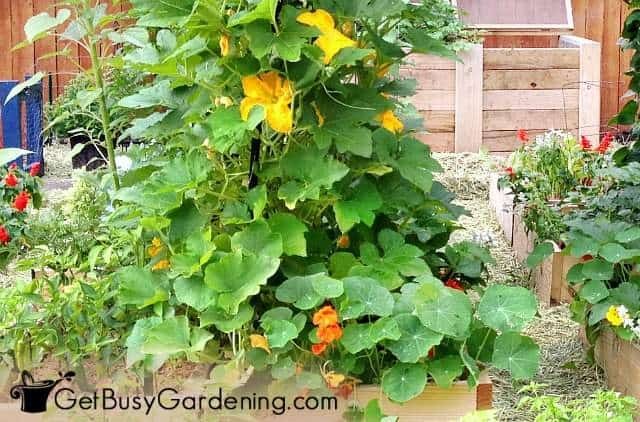 Nasturtium with squash – Nasturtium companion planting deters squash bugs and other pests that plague squash plants. It also attracts pollinators, and looks beautiful flowering with the squash too. 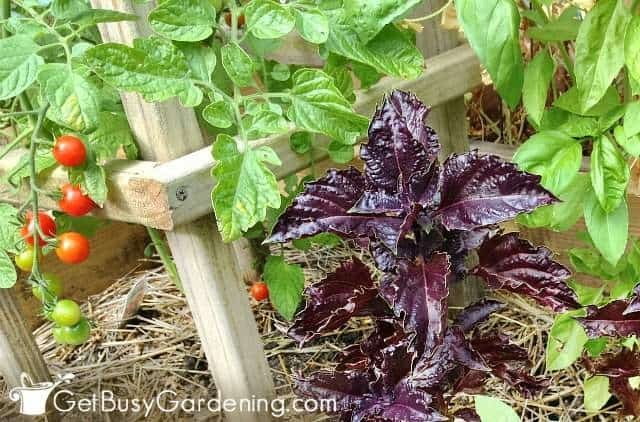 Planting basil with tomatoes and peppers – Both green and purple basil are good companion plants for tomatoes and peppers. Basil is said to enhance their flavor, and it deters many pest insects. It also attracts pollinators to the garden if allowed to flower. Cilantro with spinach – Cilantro encourages the growth of spinach, and is great for repelling pests like aphids and whiteflies. Spinach with peas – Peas help to shade the spinach, and both plants help each other grow. Beans with lettuce and other salad greens – Pole beans add nitrogen to the soil, and also protect cool season vegetables that like shade, like lettuce and other greens. Growing pole beans on something like an a-frame support, and then planting the greens underneath is a great space saver! Planting marigolds with vegetables – Marigold flowers attract beneficial insects, and help deter pests. They are one of the best flowers to plant with vegetables. 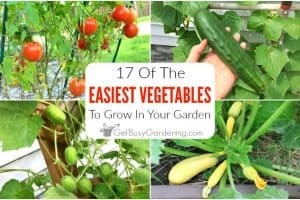 I love using them to border my vegetable garden, and plant as many as I can every year. You can never have too many marigolds. Rue with roses – Rue are good companion plants for roses to keep pests away (like Japanese beetles). These aren’t vegetables, but I wanted to add this pairing here to show you that companion gardening isn’t just for the vegetables. 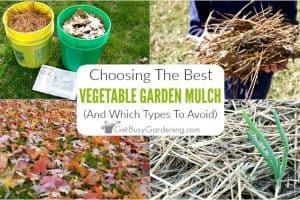 There are also beneficial plant pairings you can use in your flower garden too. Like I mentioned at the beginning of this post, vegetable garden companion planting is a huge topic! This list is only the tip of the iceberg, but gives you some really great combos to start with. 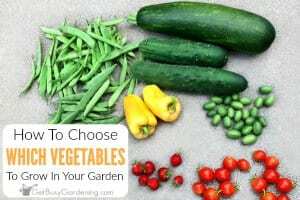 It really is a fascinating topic, so hopefully you’ll do more research to learn more about which vegetables to grow together, and the best companion plants to use in your garden. 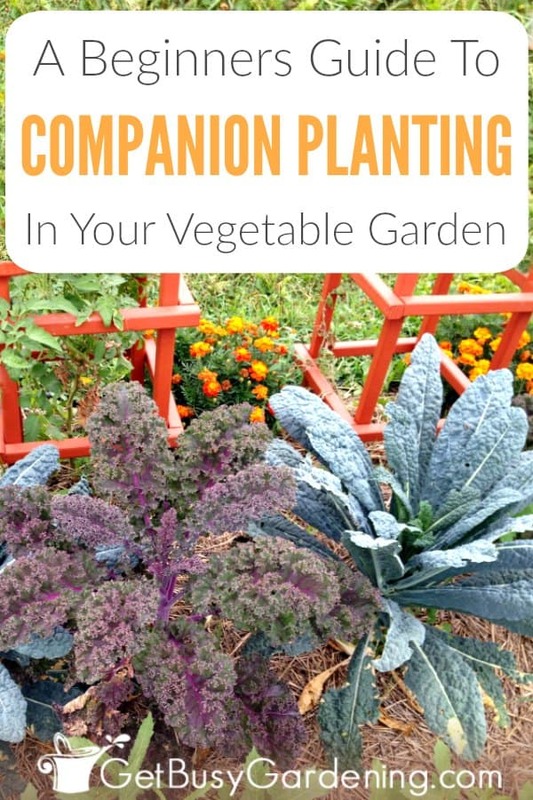 Have you ever tried companion planting? Tell me about your favorite combinations of compatible plants in the comment section below. Great combinations and good luck! I also decided to plan my garden with companion planting in mind, and found so much out there, it felt like a puzzle while planning my garden. We have a limited amount of space, and we're gardening in a new area, so we wanted to be sure to attract lots of good critters to help out! Best of luck and I'll be reading to see how it goes!! Thank you! It's overwhelming isn't it? I feel the same way. Good luck to you too! Radish and eggplant! I always sacrifice my radishes to flea beetles since they will still grow fine even when ravaged by them. I hear dill can be a great sacrificial plant too for lots of things. Yes, flea beetles love the radishes in my garden too! I hate to think of them as sacrificial plants though, LOL! But I know they are a common one. The radishes do seem to grow just fine even with the flea beetle damage, and it’s good to know you have had the same experience. I've been using companion plants since I started gardening. I use basil with tomatoes and peppers, dill with my cukes, marigolds with my beans and squash and geraniums around the perimeter of my garden. Cool! I always use marigolds around the perimeter of my garden too, but I'll have to add geraniums. They’re so beautiful! 🙂 Thanks for sharing your companion planting combos! Somebody told me that parsley will enhance the flavor of cukes and deter pests, so we're trying that out this year. I'll keep you posted. We pretty much to a mish-mash of smelly herbs and flowers around our veggies. A lot of the pest deterrent / beneficial insect attractant qualities of many companion plants seem to have to do with the strong fragrance. I can't wait to see if I notice a difference this year. I never head of the parsley/cuke combo. I have room in the cucumber bed, I might just have to run out and get some parsley! Thanks for that tip. I've used marigolds around the garden perimeter for as long as I can remember. I was excited to read about these others. What a great way to combats bugs naturally! Yes, I agree. I love the idea of companion planting to help with pest control, organic gardeners need all the help we can get! Don't you just love the look of marigolds bordering the vegetable garden. They are one of my favorite flowers! I plant two tomatoes in a large plastic tote and place them (I have 24 totes) on my asphalt driveway in the sun. I found I got a lot more harvest due to the heat of the asphalt rather than in my raised bed which don’t get enough sun. Someone said basil was a good companion plant for tomatoes. Would there be enough room in the pot for a couple of basil plants. I would not want my tomato plants to be overcrowded. Yes, tomatoes love the extra heat! Great idea. You could try growing a few basil plants in with your tomatoes, depending on the size of the containers. The basil probably won’t grow very large and crowd out your tomatoes because the tomatoes will probably shade them too much. Keep the basil plants bushy and short by pinching out the top growth. That will help keep them smaller too. You could also just plant the basil plants in their own containers and put them between or next to the totes of tomato plants. Megan, my daughter & family have moved back home & will garden in my backyard this year! Just waiting impatiently for Spring to arrive! Silly old groundhog, anyway! I’ve never tried companion planting in my garden. Definitely going to look into doing it this year, though. Thanks for the info! I’ve heard of companion planting, but have yet to try it in my garden. I think I’ll give it a shot with herbs and veggies this year! I am starting my 2nd garden this Spring! I knew that Marigolds were good for your garden, so I planted one (yes, only one) Marigold bush in my garden last year. I don’t know if it helped, but I loved the color and I cut the flowers and brought them in (they are long lastsing too). I somehow managed to plant nasturium near my squash, but that was just coincidence! I’ll do it this year again! Thank you for this post! Oh, that’s funny that you already had a few good plant pairings in your garden by accident. Love it! Have fun with your new garden!! I read somewhere that Rue is also a good cat deterrent- this is useful if you have a problem with cats fouling your veggie patch! Just wondering how your results were with your companion planting? I’m very curious! I love reading about your experiments. Awe thanks! The Nasturtium seemed to work great. I planted it in half of my community garden (the garden is full of squash plants) and sure enough, there were squash bugs only on the side where I didn’t plant it. I’m not sure if that was coincidence or not, but I’m definitely going to keep that combo in the future (if nothing else, it’s a very pretty combo!). Marigolds are definitely a must in my veggie garden! I also have had a terrible time with flea beetles over the past few years, and the companion planting didn’t seem to help. The rest seemed to work, but I didn’t notice any substantial differences. Wow good to know! I just moved to Minneapolis last year, so I’m really looking forward to implementing some of these ideas when I buy a house next year and can finally do some real gardening. I’ve only got container plants now and a homemade hydroponics deal for herbs currently! Alternating rows of onions and carrots keeps carrot flies away.